The Agitos Foundation’s Organisational Capacity Programme has helped the National Paralympic Committee to strengthen its development of para-sport. A successful Agitos Foundation programme which aims to build resources and expertise in National Paralympic Committees (NPCs) and other organisations involved with para-sport has achieved its latest triumph by helping the Solomon Islands towards an athlete pathway for Rio 2016. The Organisational Capacity Programme (OCP) is designed to strengthen NPCs in the areas of governance, management, leadership and sport promotion, supporting them to improve their overall capacity to develop and support para-athletes in reaching their full potential. 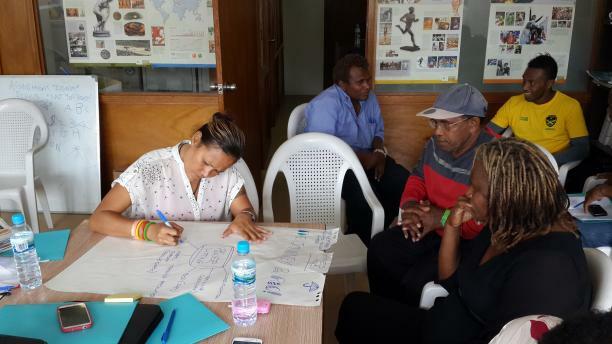 From 28-29 October, a representative from the Oceania Paralympic Committee travelled to Honiara in the Solomon Islands to conduct a workshop after participating in a training session run by the Agitos Foundation and IPC Academy in February 2014. The event gathered people from across the sporting landscape including NPC officials, government representatives, National Federations and the National Olympic Committee (NOC). It was designed to take the NPC’s strategic plan to the next level by working with federations and other Member organisations to improve their capabilities. Talks and discussions took place on the Paralympic Movement, Paralympic Games, athlete development and finance and fundraising and as a result a pathway was sketched out for the countries’ participation at Rio 2016. This follows on from their Games debut at London 2012 with shot put thrower Hellen Glenda Saohaga. The NPC and NOC also vowed to work closer together to take para-sport to new heights. Speaking after the workshop, Nina Davies, the President of the NPC said it was the method of teaching that made a huge difference to its success. Delivered by the IPC Academy and the Agitos Foundation, the OCP prioritises learning and training opportunities for NPC and National Federation staff and volunteers in the key areas that the IPC targets as strategic priorities, so that they can deliver workshops in their own countries and regions and take para-sport to new levels. You can find out more about the Organisational Capacity Programme at the IPC Academy website and the Agitos Foundation website.